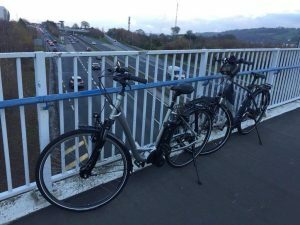 There are many surveys reporting that people with electric bikes are likely to use them far more often than those with ordinary bikes. Yesterday proved that for us! 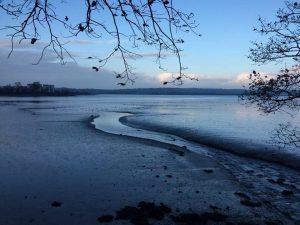 You don’t expect to have a wonderful cycle on a mediocre Sunday in late November, and yet ours turned into a really enjoyable local adventure. 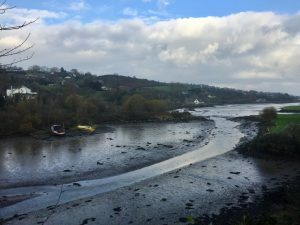 Setting off along the Greenway past Blackrock Castle in slight drizzle, we thought we might just go as far as Rochestown and back. 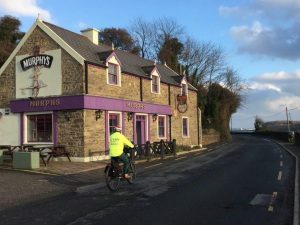 However, our electric bikes enticed us up the long steep hill that goes from the (sadly burned down, but slowly being rebuilt) Rochestown Inn up and over to Monkstown. It’s a tough hill, but not much bother to our e-bikes. 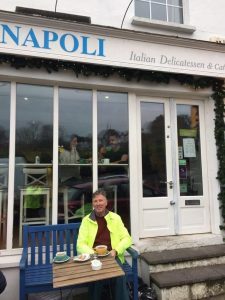 Our reward was a lovely cup of coffee at the little Italian Cafe, Napoli, in Monkstown. We could sit outside in all our gear and enjoy a view of the harbour. That taken care of, we ventured further and cycled through Raffeen and over towards Ringaskiddy. Our new Kalkhoff and Kreidler bikes are Gates carbon belt-drive bikes. A belt-driven bike is chainless and instead uses a toothed synchronous belt which is lubrication-free and very low maintenance. They don’t rust, can’t dirty your hands or clothes and they make your cycling experience especially smooth and quiet. On the back roads, we could really test this out and yes, peace and tranquility were the order of the day. Finally, sense prevailed and we turned for home, happy this time to take the easy coastal route. The weather had improved and there’s always something to see along the way. 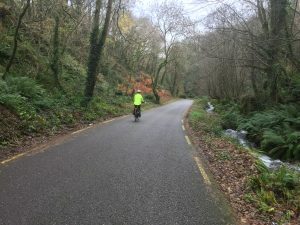 Cycling back along the Greenway between Passage and Blackrock can be busy on Sundays, but in November it was quiet enough. 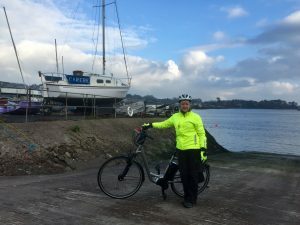 A tolerant and relaxed mindset is required when cycling this route. You can’t expect to get in a fast cycling workout; think of it as a social outing with most people sharing the path in reasonable harmony. Ring your bell gently at a good distance and don’t get too upset if you have to brake. If you allow yourself to get mad at the person with the very long dog lead, or the group who just won’t move to the side, you’ll spoil your cycle. It takes practice and tolerance, but it can be done and the benefits are huge. Looking down at the traffic from the flyover near Mahon Point is always a thrill (accompanied by a touch of smugness we must admit). Yesterday wasn’t too bad, but we were still glad to be on our bikes. It was a surprisingly great day out and we certainly would not have ventured forth if our trusty electric steads hadn’t called so temptingly.